Take a look at our most durable full-size US Sankey coupler! * Lever handles just aren't as tough as this solid wing handle. Sankey coupler designs do vary and this one is most ideal for slim 1/4 kegs with high walls around the coupler fitting. This is NOT a low profile coupler. 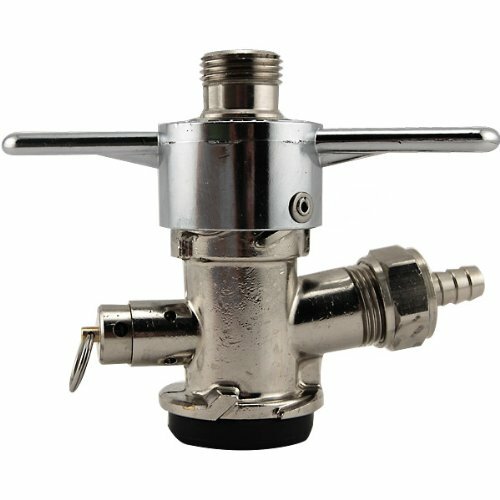 * This coupler fits D-System keg tap valves, which means it's exactly what you need to serve the majority of beers brewed in the United States and Canada. It'll dispense Budweiser, Michelob, Busch, Miller Lite, Milwaukee's Best, Coors Light, Killian's, Sam Adams, Pete's Wicked, Molson, Labatt, OV, Moosehead and so many more. * Click here for a complete list of keg coupler systems by beer brand. * Specs - Dimensions: 4 1/8" H x 4 1/8"W x 5 1/2"D.
Made with durable hard nickel plating and an internal safety relief device. Works for most domestic beers. Extremely durable; ideal for commercial bars, restaurants and tap rental programs. This is NOT a low profile coupler. Dimensions: 4 1/8" H x 4 1/8"W x 5 1/2"D.